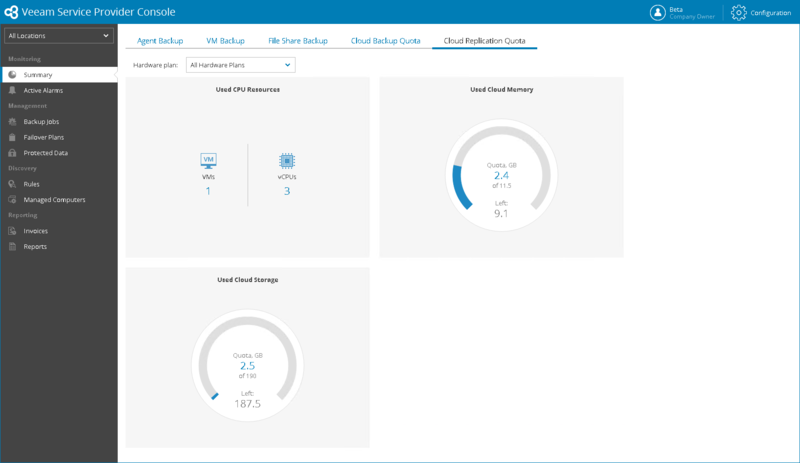 The Summary dashboard consolidates information about computers protected with Veeam backup agents, VMs protected with Veeam Backup & Replication, as well as details on the amount of cloud resources consumed by the company. To access this dashboard, a user must have one of the following roles assigned: Company Owner, Location Administrator, Location User. In the menu on the left, click Summary. The Agent Backup dashboard view provides summary information about computers protected with Veeam backup agents. A protected computer is a computer that has at least one backup restore point. Protected Servers widget shows the number of computers that run Veeam backup agents in the Server mode and have at least one backup restore point. The widget details the status of the latest Veeam backup agent job session, and shows how many job sessions completed successfully, or ended up with warnings or errors. Protected Workstations widget shows the number of computers that run Veeam backup agents in the Workstation mode and have at least one backup restore point. The widget shows the status of the latest Veeam backup agent job session, and shows how many job sessions completed successfully, or ended up with warnings or errors. Protected Computers by Backup Target widget shows types of target locations on which backups of protected computers are stored. The widget details how many Veeam backup agents store their backups locally, on cloud repositories, on a network share or on a Veeam Backup & Replication repository. Protected Computers by Job Status widget shows number of job sessions finished with different results. The widget details how many jobs finished successfully, finished with warning or failed. 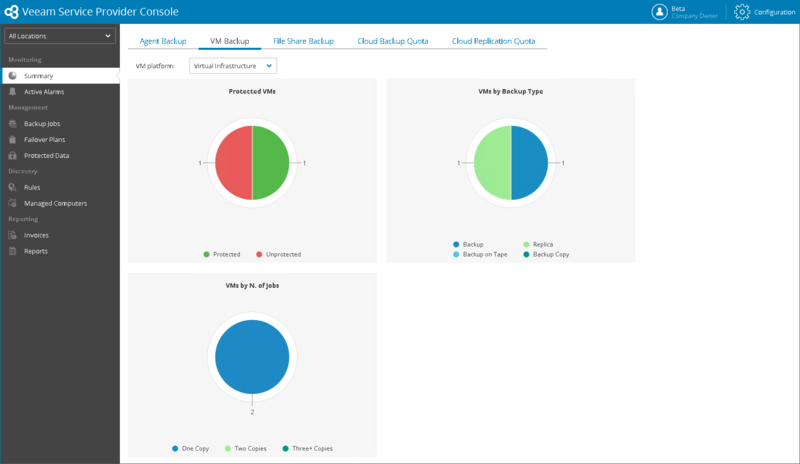 The VM Backup dashboard view provides summary information about VMs protected with Veeam Backup & Replication. A protected VM is a VM that has a backup or replica restore point. Protected VMs widget shows the number of protected VMs. The widget details the status of the latest Veeam Backup & Replication job session that protects the VMs, and shows how many job sessions completed successfully, or ended up with warnings or errors. VMs by Backup Type widget shows how many VMs are protected with backup and replication jobs. VMs by Backup Copies widget shows how many protected VMs have backup copies. 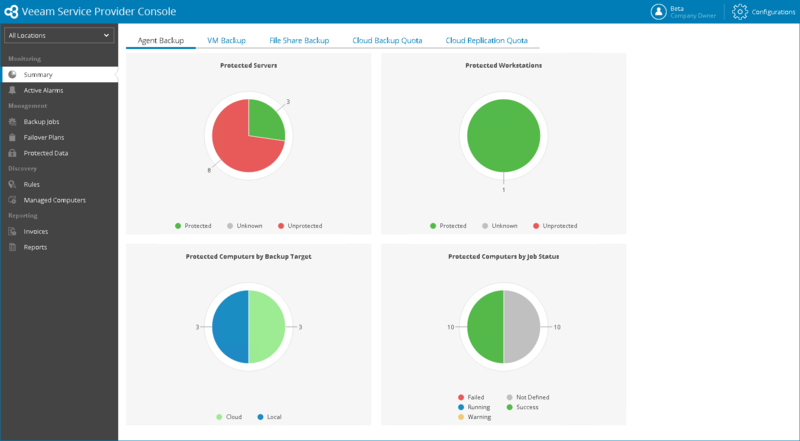 The widget chart details the number of protected VMs that have backup copies stored offsite (in the cloud), locally on the client side, and the number of protected VMs without backup copies. The Cloud Backup Quota dashboard view provides information about cloud repository resources allocated for the company, used and remaining cloud resources. Used Storage widget shows the amount of space allocated for the company on all cloud repositories, the amount of used and remaining space. VMs Stored in Cloud Repository widget shows the VM quota set for the company by the service provider, the number of VMs already stored in cloud repositories, and the remaining VM quota. Workstations Stored in Cloud Repository widget shows the workstation quota set for the company by the service provider, the number of workstations already stored in cloud repositories, and the remaining workstation quota. Servers Stored in Cloud Repository widget shows the server quota set for the company by the service provider, the number of servers already stored in cloud repositories, and the remaining server quota. Data Transfer Out widget shows the data transfer out quota set for the company by the service provider, the amount of data already downloaded from cloud repositories during the current billing period (length of time between two successive invoices), and the remaining data transfer out quota. 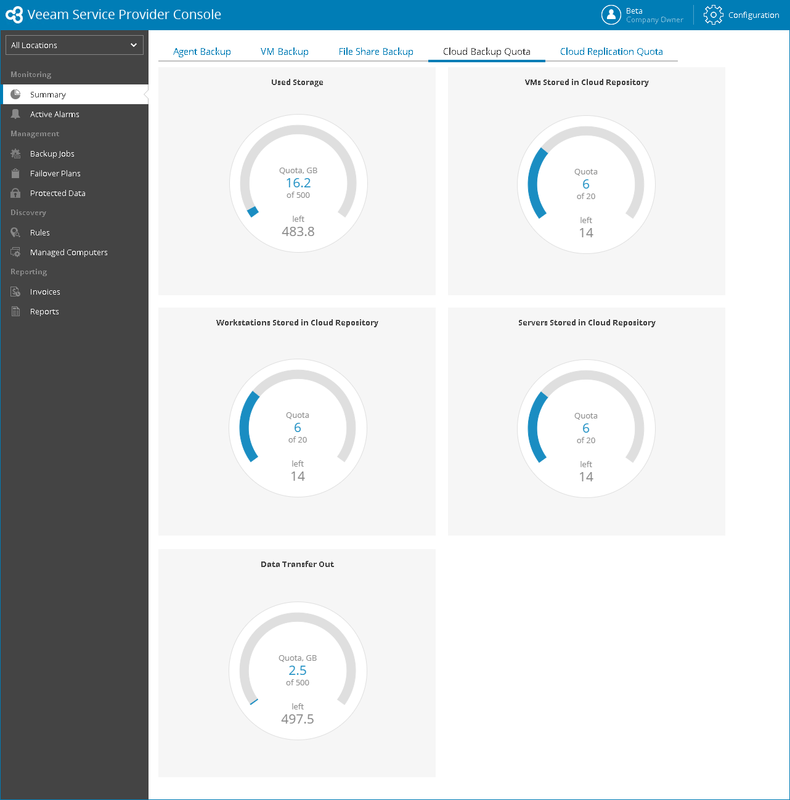 The Cloud Backup Quota dashboard view provides information about cloud host resources allocated for the company, used and remaining cloud resources. Used CPU Resources widget shows the number of configured vCPUs, and the number of cloud VM replicas on which these vCPUs are configured. By default, the widget shows information for all hardware plans by which the company is subscribed. To choose a specific hardware plan, use the list at the top of the widget. User Cloud Memory widget shows the amount of memory allocated for cloud VM replicas, the amount of already used memory, and the remaining memory. Used Cloud Storage widget shows the amount of cloud storage space allocated for the company cloud VM replicas, the amount of used and remaining space.